I read the Stonehill News blog occasionally, because I'm an avid hiker, and I like the wildlife updates. I wanted you & your community to know about this bobcat I saw today on Chaney Tr., which was acting unusual. I was driving back from Millard, and saw it cross the road. 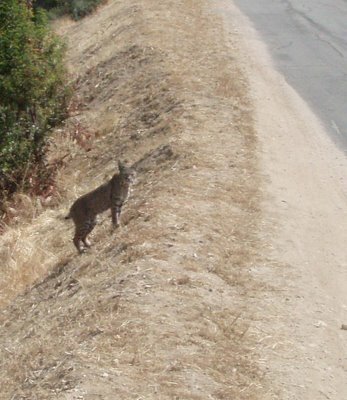 It stopped to look at my car, then walked into the brush. I pulled forward and stopped, and got my camera out, hoping to see it down the embankment. 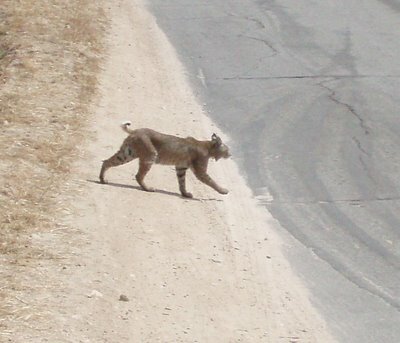 When I got out of my car, it had walked back up to the road. It simply sat there looking at me for a few minutes, which wouldn't be too strange, except it was vocalizing - sometimes growling, sometimes meowing like a housecat. It then walked back across the road one more time, and up the road cut on the other side. 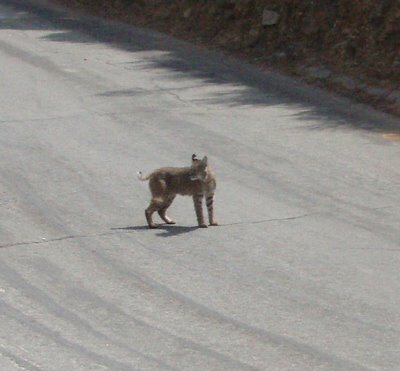 I have seen a couple of bobcats on hikes before, but they always run away quickly. So I wanted to give you a heads up. I'm sure everyone knows the standard advice - keep pets inside at night, don't leave food out, and just generally be aware. Hopefully this cat isn't sick, and I just had a lucky sighting. This is a very young animal, weighing probably 10 pounds or so. Not a physical threat to anyone, unless it is in fact rabid. Attached are the best photos, cropped and zoomed (I only got within about 20 feet, which was close enough for my comfort). The full set of pics are on my photobucket page, here.